Arizona Senator among series of lawmakers to criticize Trump following his summit with Russian President. 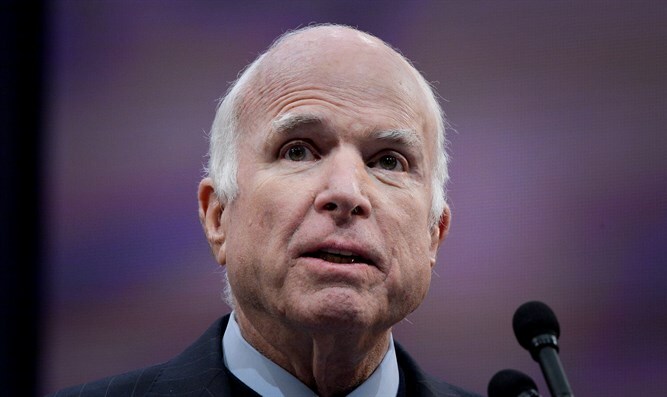 “Coming close on the heels of President Trump’s bombastic and erratic conduct towards our closest friends and allies in Brussels and Britain, today’s press conference marks a recent low point in the history of the American presidency,” said McCain. McCain, a longtime critic of Trump, on Friday suggested that Trump should cancel his meeting with Putin if he is not prepared to hold Putin "accountable" for aggression toward the U.S. While McCain backed Trump in the presidential election in 2016, he previously said he has serious concerns about Trump, backing former Republican nominee Mitt Romney in his criticism. In a memoir released in May, McCain accuses the President of failing to uphold U.S. values by showering praise on international "tyrants," discrediting the media, ignoring human rights and demeaning refugees. McCain was joined on Monday by a host of other U.S. lawmakers, both Republican and Democratic, who criticized the Trump-Putin summit. “When he had the opportunity to defend our intelligence agencies who work for him, I was very disappointed and saddened with the equivalency that he gave between them and what Putin was saying,” Corker told CNN in a reference to intelligence conclusions that Moscow interfered in the 2016 U.S. election and Putin’s denials that Republican Trump apparently accepted. “The president’s comments made us look as a nation more like a pushover and I was disappointed in that,” he added.